Chicken tagine seems to have replaced ordinary roast chicken as our favourite Sunday lunch, well, it has for me anyway. I think it’s something to do with the fact that having disliked the flavour of aniseed for so long, I’ve finally grown to love fennel and now want to eat it at every opportunity. I love that the fennel, onions and preserved lemons seem to melt into the sauce in this dish, making an almost creamy sauce, without the added fat. Wonderfully comforting on a cold day. I played around with this recipe a little, using both fresh fennel and fennel seed to produce a deeper flavour that developed both in the mouth as we ate and continued overnight so that the follow day’s lunch was even better. I also marinated the chicken for a few hours which I didn’t last time and, although I don’t think it makes a huge amount of difference, I think it does make some. Even more olives and preserved lemons this time too, to really boost the zingyness. This is my favourite attempt so far, next time I’d like to increase the chicken flavour a little but I think that’s easily achieved with a better stock (I didn’t have much time to cook the stock this time so what I had was a little watery). It’s just over a week since we ate this and I haven’t been able to stop thinking about it soon. If things go quiet around here again then you’ll know it’s because we’ve been living entirely on chicken tagine. Start by making up the spice mix. Toss the chicken in the spices and marinate overnight (if you have time) or for as long as you have. Brown the chicken pieces in some oil over a medium heat. There’s no need to remove the chicken so when it is brown all over, just add the onions and allow them to soften (about 3 minutes) before adding the garlic and fennel. Cook for another 3 minutes or so and then add the saffron, preserved lemons, olives and chicken stock. Bring to the boil, reduce the heat and cook with the lid on for 1.5 hours. This should be about the right amount of stock but check occasionally to make sure it hasn’t cooked out entirely. If you’re left with too much liquid then reduce it down by cooking without the lid on for the last half an hour. Just before serving, add a large handful of roughly chopped coriander and serve over some couscous or rice, sprinkled with toasted almonds. 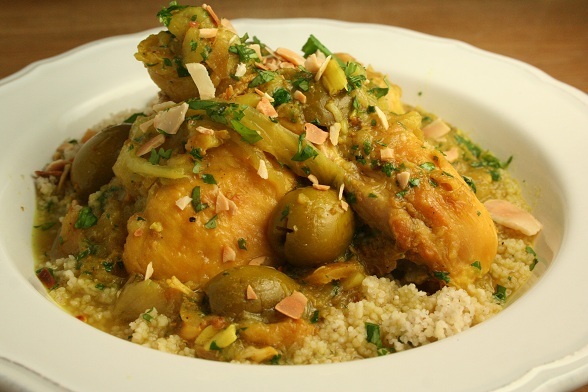 Subscribe to comments with RSS	or TrackBack to 'Chicken Tagine'. I’ve never made a chicken tagine (always lamb for some reason) but you are tempting me. I am not a fan of fennel but perhaps I should try and ‘rediscover’ it! Conversely, I’ve never made a lamb tagine, Antonia! It’s going to feature soon though. Thanks, Becky. I hope yours turns out well. Jenny Eatwell´s last blog post ..Greek Lamb &amp Orzo Bake – what a triumph! Jenny we cheated I’m afraid – we do have a proper Tagine but we just casseroled it in something else and then served it in the Tagine. We should definitely try it though and see if it makes any difference.